The 89-room hotel has a pool, restaurant, lounge, patio and 10 different room types. The Sarasota Modern hotel is bent on doing things with a bit of a design twist. The hotel’s shuttle is a 1970s Volkswagen bus. Suites feature clawfoot bathtubs on the balconies. And the hotel restaurant is dubbed “Rudolph’s” after Paul Rudolph, the famed architect who designed several Sarasota landmarks and once served as the dean of the Yale School of Architecture. The Modern held its soft opening in mid-December — joining a downtown Sarasota hotel surge that’s brought hundreds of new rooms to market. Others include the Art Ovation Hotel, The Westin Sarasota and Embassy Suites. The Rosemary District has seen a boom in development projects and new businesses in recent years. Cincotta says he knew they were investing in what he calls “one of the coolest parts of town.” He also purchased property adjacent to the hotel for possible expansion options. That space could be used for condos, more hotel rooms, additional event space or gallery space in the future. Site work for The Sarasota Modern started in April 2017 with a year-and-a-half build schedule. Hurricane Irma, Cincotta says, added eight weeks, with steel shipments delayed by the storm. Hotel construction costs came to $17 million. The contractor was Gilbane Building Co., and the architect was Stephen Chung of Boston, with Hoyt Architects in Sarasota as production architects. “It’s a Swiss watch of a building the way it fits together,” Cincotta says. The hotel has a pool, restaurant, lounge, patio and 10 different room types. In-season room rates range from $229 to $699. The core challenge now, Cincotta says, is communicating the hotel’s attributes to potential guests through the internet, front desk and other strategies. The Sarasota Modern is a Tribute Portfolio hotel that’s a soft brand of Marriott, developed as an independent concept and design. The hotel’s franchise agreement allows it to use Marriott infrastructure such as the company’s reservation platform. It also helps with marketing, employee training and gaining access to the business traveler market. Courtesy. 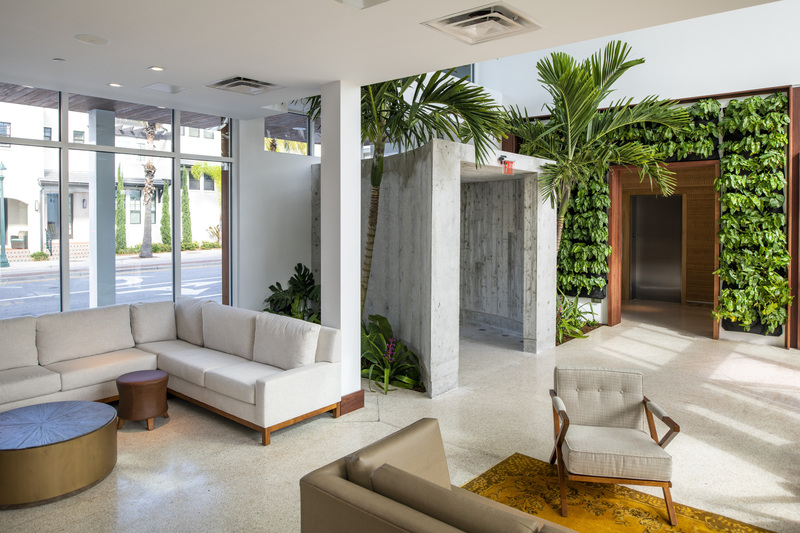 The Sarasota Modern hotel took design inspiration from the Sarasota School of Architecture. In return, The Sarasota Modern provides a brand loyalty fee in the form of a percentage of revenue. Cincotta says the arrangement solves some of the problems of running a hotel. “We can tap into Marriott’s abilities,” he says. The Cincotta Co.’s other projects include a 160-key hotel in Boston, projected for a groundbreaking later this year. He plans to turn his attention to the next phase of the Sarasota project, too, saying the “Modern” hotel concept pioneered in Sarasota could be replicated in other cities.